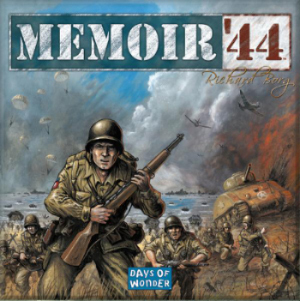 Memoir ’44 is a war-themed strategy board game for two-players. The game simulates battles connected with the D-Day invations in WWII. There are different scenarios available from the manual, the internet but players can also invent their own ones. The standard game offers 15 different scenarios. For this, the terrain and starting positions are laid out according to the scenario. It's really fun to play famous historical battles like including Omaha Beach, Pegasus Bridge, Operation Cobra and the Ardennes. 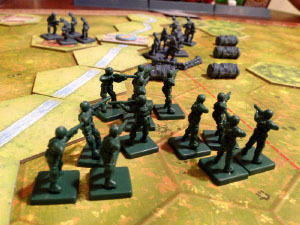 The battlefield is a hexagon-gridded board. It's divided into 3 sections giving the players a left, center and right section. Your order your troops (infantry, paratrooper, tank, artillery and even resistance fighters) by playing section cards and tactic cards. The section cards are used to let your troops move or battle in a specific section. The cards say in which section the units may be given orders or how many units may be commanded. The tactic cards all your unitls to make special moves or actions as explained on the card. Order – You choose which units will be activating this turn. Move – Move all your active units. Battle – Each of your ordered units can fight the enemy. The battle is done in 3 easy steps. You check the range of your units as units can attack a few hexes away, but roll one less die per hex distance. You also check the terrain as this can affect your attacks. i.e. for attacks in a forst or city, you roll 1 less die. To resolve the battle, you roll the appropriate amount of dice. For each symbol you roll that matches the attacked units, you will kill one unit. When you have killed all figures in a unit, you will gain a victory medal. To win the game, you have to win a set number of victory medals. These medals are gained for each enemy unit entirely eliminated from the battlefield. But you can also gain medals from the board map itself. i.e. for capturing or holding certain positions on the map. The games take between 30 and 60 minutes depending on the scenarios. 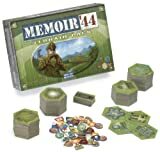 Memoir is very easy to learn and fast-paced, the game still requires strategic card play and timely dice rolling. You also need to an aggressive but adjustable battle plan to win the game. Although the game was designed for 2 players, it easily accommodates team play. 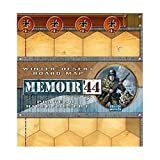 You can play Memoir '44 up to 6 players when you play in teams and even up to 8 players in the "Overlord" scenarios, but this requires two copies of the game. 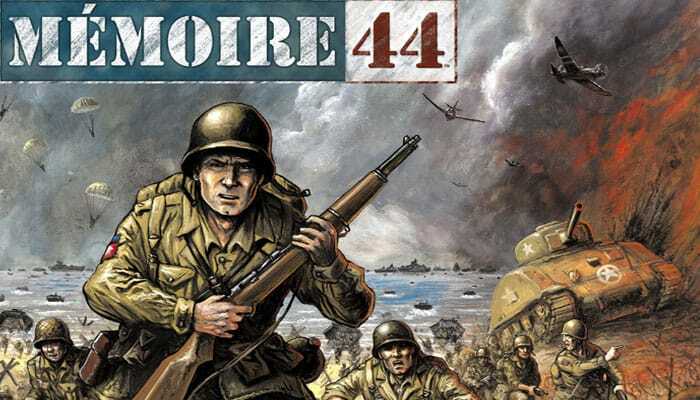 There are several expansion packs available like the terrain pack, the eastern front, the winder / desert board map, the pacific theatre, the mediterranean theatre, the air pack and operation overlord. The game was created by Richard Borg and published in 2004 by Days of Wonder.